Sales, amounting to EUR 430.17 million, were 1.6 % lower than the same period last year. This decrease is due mainly to the effect of transfer into the price of the final products the drop of methanol in the Intermediate Chemicals Division, for that reason the turnover of this division has been reduced by 13.5 %. The other two divisions -Chlorine Derivatives and Pharmaceuticals- increased their sales by 3.5 % and 9.1 %, respectively. In general, the main markets of the company remain tense with firm prices and a high volume of transactions. This situation has been seen even during the month of August, a period of seasonally low activity. The accrued expenses to September fell by 6.3 % compared with the same period last year, due to the drop in the procurements and, above all, in the supplies. Concerning of procurements, which amounted to EUR 203.48 million, the fall was 3.9 %, with significant reductions in the price of the most important raw materials: methanol and, to a lesser extent, ethylene. More significant was the drop of 23.4 % in the supplies, which amounted to EUR 72.14 million. This decline can be attributed mainly to the reduction of the electricity bill that, compared to last year, decreased by EUR 12.60 million. Also the gas, supported by the low price of oil, has evolved downward decreasing the bill by EUR 10.14 million. Personnel costs, amounting to EUR 60.12 million, have barely changed between 2015 and 2016. The effect of 2016 lower staff, mainly due to the sale of the factory of Palos de la Frontera and Salina de Huelva in 2015, has been offset by the 3.5 % wage increase implemented in 2016. This increase includes the recovery that remained pending from the frozen salary during the period 2010-2012. Costs have been reduced to a greater extent than income (-6.3 % versus -1.4 %), which has meant an increase in gross operating profit (ebitda) for the first nine months of 2016 to EUR 46.95 million, 88 % above the ebitda for the same period of 2015, which was EUR 24.98 million. That is to say, in the first nine months of the year the ebitda of 2015, which was already very reasonable, has increased by EUR 21.97 million. Consequently, the ebitda margin on sales rose from 5.7 % reached in the first nine months of 2015, to 10.9% earned this year. As in the two previous quarters, in the third quarter we continue surpassing the Company's goal, set at 10 %. Amortization, amounting to EUR 14.78 million, has declined slightly in the period. From the financial results must be highlighted the reduction in financial expenses by EUR 1.63 million, due to the lower debt and the reducing exchange gains in virtually the same amount, thanks to the stability of the dollar against the euro in 2016 compared to the sharp appreciation of the US dollar in the first quarter of 2015. Finally, the Company recorded expenses for income tax by EUR 0.45 million. Thus, net profit reached EUR 27.28 million, a figure 4.6 times higher than that achieved in the same period of 2015, which was EUR 5.88 million. 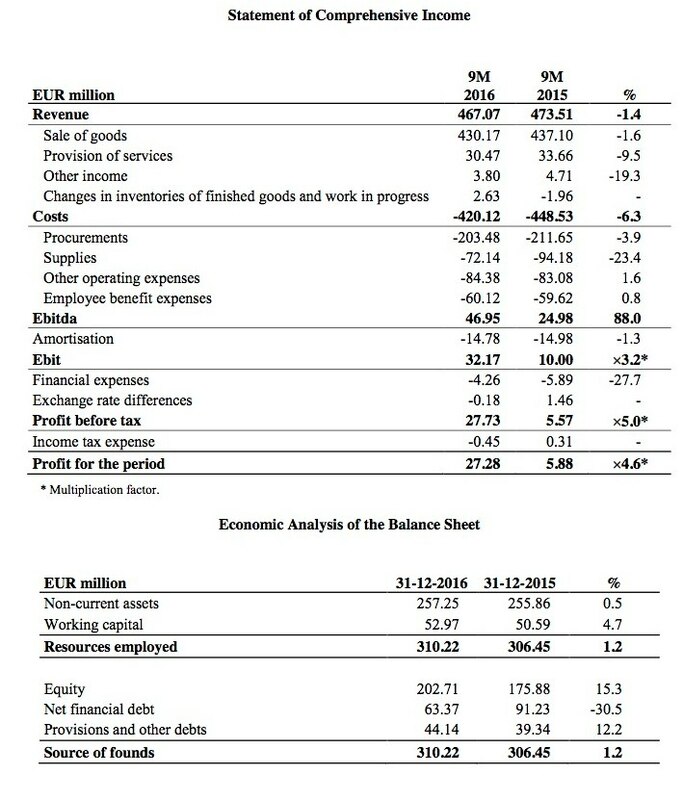 At the comparison of the balance sheet at September 30, 2016 and the relevant for the end of 2015, must be noted, on the one hand, the increase by EUR 26.83 million of equity, due to the profits made over the reference period and, on the other hand, the decrease in net financial debt (NFD) by EUR 27.86 million. As of September 30 of this year, net financial debt amounted to EUR 63.37 million compared to a debt of EUR 91.23 million at December 31, 2015. This decrease has been a significant improvement in the coverage ratio debt (NFD/ebitda) that in the last 12 months has gone from 5.17 to 1.16, clearly reflecting the significant increase in the ability of the Company to meet its debts. For the last quarter of 2016 we expect a slowdown in the upward trend due to: (i) the seasonality of December; (ii) the increased cost of energy, especially electricity, and (iii) a temporary activity stop by force majeure in the supply chain decreed by our main chlorine customer. However, Ercros expects the strong demand for its main products, with prices evolving upward, and industrial efficiency measures adopted to mitigate the aforementioned negative impacts.